Morey Middle School seeks to ensure that all students are highly prepared for academic, social, and personal success through a diverse and enriched educational experience that comes from a balance of both experiential and academic learning. Motivated, Organized, Respectful, Empathetic students. Communication Communication establishes a harmonious connection between students and staff by voicing opinions and new information, leading to the creation of respect, trust, and teamwork. To persevere through challenges is to achieve success. Patience Patience is not the ability to wait, but how you act while waiting. Respect Regardless of race, culture, age, or gender, all deserve to be honored and appreciated. Success We strive towards completing our goals in order to be proud of our accomplishments; through communication, grit, respect, and patience, we achieve our goals. Support student college & career readiness through a deep focus upon reducing the rate of student tardies and increasing the rate of student work completion. *These goals are elements of the school’s Unified Improvement Plan on file with the Colorado Department of Education. You will learn best if you are in school every day.� We expect your attendance to be 95% or better. That means you can miss no more than 9 days per school year.� If you are sick, your parent must call the attendance line, 720-424-0736 to report your absence. Excused Absence�”an absence for which your parent has given approval, and the reasons for the absence are approved by school officials. Unexcused Absence�”an absence for which your parent has given approval but the reasons are not approved by school officials. Truancy�”an absence for which neither your parent nor the school officials have given approval. All absences, excused or unexcused, count toward the 9 allowed absences. Withdrawal from School: If you withdraw from school, your parent/guardian must come in and withdraw you.� You need to return all books, materials, and clear any fines/fees from the Treasurer’s office. Doors open at 7:38. If you arrive after 7:45 AM, you must obtain a tardy slip from the main office in order to be admitted to class. A note from a doctor or dentist is required to excuse a tardy to school. You are expected to be punctual for all classes. 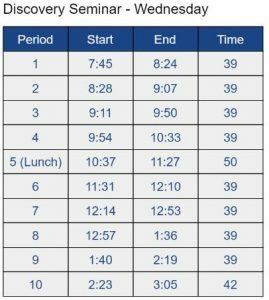 Tardy policy consequences for earning more than 3 tardies to school or to class will be taught to you during Orientation. The first and last day of each week begins with Mustang Meeting, led by a teacher advisor. Your advisor is the main teacher to support you throughout middle school. During Mustang Meeting, you will celebrate successes, collaborate with other students, engage in character education lessons, and hear announcements. Each official grading period is 9 weeks, although teachers will post current grades every 3 weeks. At the end of the year, you will receive a report indicating your mastery of each standard. During the year, you will receive number scores on assignments and on progress reports indicating your progress toward meeting each standard. 3 = assignment reflects proficient work.� Student is on track to meet standards. 2 = assignment reflects partially proficient work.� Student is not quite on track to meet the standard. Report cards are held at the end of the year if you owe library fines or school fees. Unpaid fees also affect participation in the 8th grade Elitch Gardens celebration and the Continuation ceremony. Each quarter, students will be rewarded with a field trip or other valuable experience for students who are “on track” as indicated above. Mustang Meeting teachers will meet with students weekly who are “off track.” Students who are “off track” at any point during a quarter will have an opportunity to get back on track by making up time or assignments or completing community service with a positive attitude. Any absence, excused or unexcused, will count toward the 95% attendance goal. Absences due to religious holidays are exempt. 8th graders are eligible for the Continuation Ceremony and a trip to Elitch Gardens in May, honoring their moving on to success at the high school level, when they meet On Track / Off Track requirements for 4th quarter. In addition, HGT students must complete a Passion Project with a score of 3. Homework is an important part of independent learning and becoming a life-long learner. Teachers will ask you to practice what you are doing in class and make connections between class learning and other things that interest you.� Use your planner and binder to stay organized and manage your time. If you are absent, please email your teacher and request your assignments.� You will have two days to complete makeup work. If you do not complete an assignment for any reason, your teacher may assign you to a homework intervention before or after school or at lunch. In October and February, you will share your learning portfolios with your guardians and reflect on your progress towards meeting the course standards. You are expected to lead your own conferences as a way to take charge of your own learning. Teachers will be close by to support you. Hot breakfast is served in the cafeteria from 7:15 am to 7:35 am, and is free for all students. Anyone wishing to eat breakfast must enter the west Morey entrance nearest the garden. There will be no access to lockers or classrooms during this time. Students will be expected to sit in their seats after obtaining their breakfast and will remain there until they are dismissed to go to class. Students will not be permitted to bring cafeteria food out of the cafeteria. If they wish to go back outside, they may put their trash in the proper container and return to the blacktop through the west garden entrance. 7:35 am: The regular hot breakfast line will shut down and “Breakfast in the Classroom” bags will be provided instead. 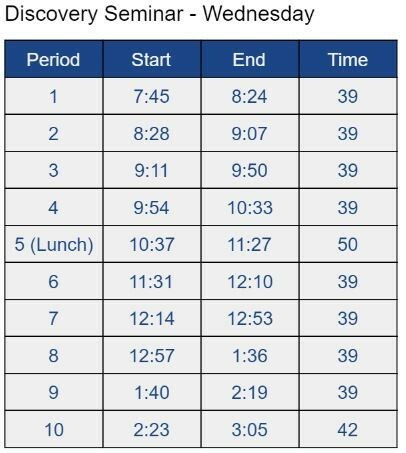 7:38 am: Once students are allowed to enter the building, all BIC bags will be available from the Breakfast Cart in the front lobby outside of the main office and the cafeteria will be closed. BIC breakfasts are not to be eaten until the student has entered his or her first period class. Students arriving after the late bell (7:45) may pick up a BIC bag from the cafeteria until 8:00 am. After 8:00 am, a limited number of BIC bags will be available in the main office. You are expected to follow generally recognized behavior expectations during lunch, including a reasonable voice level, cleaning up after yourself, and being kind and respectful of others and their property. You may not leave the building for lunch unless signed out by and accompanied by your parent/guardian. Students will be walked down to lunch or recess by their 4th period teachers and will sit at the tables before being dismissed to the lunch line by an adult. Students eating lunch before recess are expected to sit in their 4th period class groups prior to being released to the lunch lines during Student Culture Academy in the first week of school. After this time, they may sit with their friends. 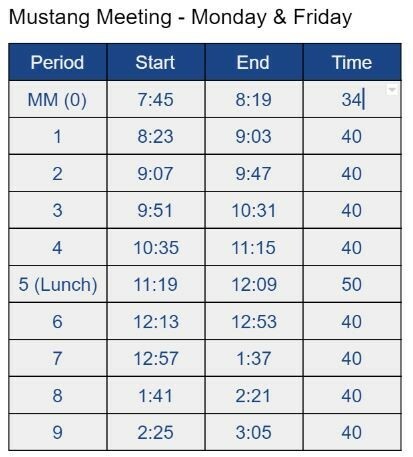 Certain circumstances may require students to sit in their Mustang Meeting groups or with their 4th period class. When the lights go off, it is an attention signal. You are expected to drop to a zero voice level immediately. Students are to remain seated at all times. If you need to get up to go somewhere (vending machine, restroom, etc), raise your hand and a staff member will release you. If you need to go to the office or the restroom, you must wear the lanyard pass. All food stays in the cafeteria. Students will be assigned to clean tables in alphabetical order on a weekly basis. When you hear the whistle, you must give adults in the area your attention. Usually this means that it is time to line up. If you want to check out recess equipment, you must sign it out from a staff member. You must also check it back in with that staff member – don’t just put the equipment back without actually checking it back in. When the whistle blows to re-enter the building, you will line up against the building, with your right shoulder against the wall and facing the back door of the school. Always remain visible to staff members. Students are not to go on the north side of the shed. Don’t climb fences or trees. If you need FREE OR REDUCED COST LUNCH, your parent/guardian must complete a form available during registration or at any time in the main office. Each student will be assigned a locker. Do not give your combination to anyone. If you forget your combination, your teacher or office staff will assist you.� Your locker is the property of Morey and is on loan to you. You may add shelves, magnets, and storage containers. No permanent or semi-permanent decoration of any kind, including markers, stickers, etc., is permitted. � School personnel can open lockers with just cause.� You may use your locker before and after school and at lunch. You need one 2-pocket folder for each core class (Language Arts, Math, Science, Social Studies). Teachers may individually communicate with families that they need a 3-ring, 2-inch binder. Teachers may require that these binders or folders stay in teachers’ classrooms. Use your backpack to carry your materials/ supplies between home and school. In school keep your backpack in your locker. Morey classrooms are small and we don’t want anyone tripping. Skateboards should remain in lockers throughout the day and during after school clubs for the same reason. After-school activities are a great way to get involved and make new friends. After-School Competitive Sports are offered each season.� You must try out to be on the team.� You must also be eligible to play in games.� This means you must be in good standing with attendance, behavior and academics. After School Clubs are open to everyone. An After School Registration Form is required.� There is a fee per semester to participate in after school clubs.� No student will be turned away for inability to pay the fee. Payment Plan Forms & Scholarship Forms are available. Listen to the announcements, visit Ms. Icove in Room 134, or see the bulletin board across from Room 101 for more information about after school clubs. Boys and Girls Club – Cope Branch picks up at Morey after school every day at approximately 4:20.� See Ms. Icove in Room 134 for more information about this program. Morey Neighborhood Center is open to students on a drop-in basis on Mondays and Wednesday until 7:15 pm. Students can play sports, go swimming, do homework, and more. Positive behavior that is compliant with Morey and after-school rules is expected of all Morey students. Continuing behavior that violates these expectations will result in students barred from participation in after-school activities for time periods ranging from two weeks to a full school year. Report all change of address or phone numbers to the Attendance Line at 720-424-0736. If school is cancelled or the start time delayed two hours, the district will inform local radio and television stations of the decision. Families are to listen to the radio on 630 or 850 AM or television channels 4, 7, or 9 for these announcements in case of bad weather. You can also check the Morey Facebook and Twitter pages, in addition to our web page. Safety drills are conducted on a periodic basis. Exit routes are placed in each room. Students are to remain silent while walking from the building during drills and during all lock-downs. Once outside, students may talk quietly, but are expected to maintain order and a sense of urgency. The school health office is open to students who are ill, injured, or have a health concern. Students come to the office with a pass from a teacher, except in emergencies when a pass is not necessary.� If a student has a specific health problem that requires medication during the school day, written instructions from parent and/or physician are required. Medication must be checked in with either the nurse, or the school secretary. No medication will be dispensed without a properly labeled prescription. The I.M.C. is open from 7:30 am to 3:15 pm.� Books may be checked out for two weeks. Language Arts teachers will handle book checkout for their classes. A Discovery Experience is an opportunity for students to participate in academic exploration and experiential learning, while building community and having fun. Students might explore a burning question, interest, idea or concept in different ways. In the fall, once per month, students will participate in community service projects as part of Service Learning Days. In the spring, students will participate in a 4-day Spring Discovery Week geared toward student interests, passions, and desire for new learning. Every Wednesday, starting in mid-September, students will participate in a Discovery Seminar elective during 10th period that will rotate quarterly. Lost items are stored for a period of time in the Main Office and then donated at the end of each quarter. Found articles should be turned in to the main office. Parents should communicate with the office at the beginning of the day if you need to be picked up for an appointment. Parents are encouraged not to leave messages for you during the school day except in emergency or time-sensitive situations. Only authorized parents or guardians or community leaders are allowed to visit classrooms. Friends or teenaged relatives of students are not allowed to visit.� Visitors must check in with the main office, show identification and receive a visitor’s badge. 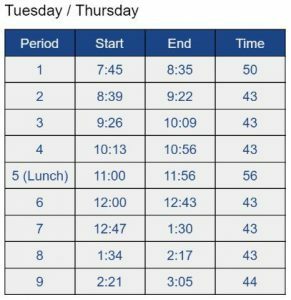 AFTER SCHOOL: All students who do not participate in supervised activities must leave the school building by 3:15 pm. Parents are expected to pick up their children from school grounds by 3:30 pm. Parents are advised that there is NO outdoor supervision for students on school grounds after 3:15 pm. Bullying is a very serious issue and is not tolerated. This does not mean that students who engage in bullying behaviors will be removed from the school, as every child has a right to an education according to the law. All attempts will be made to correct the behavior through restorative practices, counseling, and consequences that will increase in intensity as long as the behavior continues and can be documented. In extreme cases, bullying can result in suspension or expulsion. Harassment, defined as repeated, unwanted and disrespectful attention and or any behavior which has the intention or effect of harming or intimidating others. This includes social network posts and other communication forms that are harassing in nature. Once on school grounds, including being dropped off by the school bus, you are expected to remain on campus until school is dismissed unless accompanied by your parent or guardian and signed out in the main office according to school policy. Student dress and personal appearance shall meet reasonable standards of safety and cleanliness while showing respect for others. Personal appearance and dress that violate reasonable standards, demean, slur, or harass others through symbols, words or images, and/or substantially disrupt the educational process shall not be tolerated. Headwear: Sunglasses, hats, hoods, or head scarves worn inside a building. Head scarves of a religious nature are permitted as allowed under state and federal law. All grooming items must be in a student’s bag, pocket, purse, binder, or locker. Grooming items must remain put away in class. Inappropriate footwear, including bedroom slippers. Some classes may require that students wear closed toed shoes for safety purposes. Any other attire or grooming that is prohibited in the student dress code applicable to the particular school. You are strongly encouraged to not bring electronic devices to school. Cell phones and other electronic devices must remain out of sight, silent, and unused during class time and while anywhere on campus.� Devices may only be� used during lunch/recess; headphones are required for music when used in the cafeteria. Electronic devices that are seen or heard in school during the academic day outside of the lunch period will be confiscated and held in the main office until you pick them up at the end of the day.� If the behavior becomes habitual, a parent/guardian will need to pick up the device. In extreme circumstances, it may become necessary for the student to check his or her phone into the main office at the start of each school day and then check it back out again at the end of the day. The school is not responsible for loss or theft of cell phones or other electronic devices.� Investigation of theft will only take place upon receiving reliable tips. Conflict is normal. If you are in conflict seek help to resolve it without resorting to fighting. Physical or verbal fighting is not tolerated. Because it is a severe threat to all those in the learning environment, students engaged in physical violence will be separated from the school population as needed, in addition to receiving strong social and personal support in order to avoid such choices in the future. You are not permitted to chew gum anywhere in the building. Food is only permitted to be eaten in the cafeteria during designated times or in the classroom until 8 am. You are allowed to drink water from a clear plastic bottle only. Teachers may make exceptions to this rule for special occasions. You are expected to engage with other students in a positive, professional manner. As such, students are expected to refrain from any form of touching other than hand-holding or brief, mutually acceptable hugs. In the hallways, you must stay to the right and walk directly and quietly to class. You have 4 minutes to use the restroom.� You must be in your seat ready to learn when the bell rings. When you are in the halls, keep hands, feet and objects to yourself.� There is to be no horseplay, running, or yelling. Voices should be at level 2. You are not permitted in the halls during class without a pass from your teacher. Each classroom will have two laminated passes on lanyards: one color for the restroom and another pass to use for all other locations in the building.� If you are not returning to your classroom, you will be issued a yellow paper pass, or you may use your planner pass. Students are allowed one in-class bathroom visit per class per week. School leaders may restrict all hallway passes in response to hallway misbehavior during class. The use or possession of alcohol, tobacco and other substances illegal for minors is forbidden, and you will be issued tickets by law enforcement officials if you are found in possession of these items. This rule also applies to inappropriate use of glue, liquids, vapors or gases. We expect Mustangs to use school appropriate language at all times.� Swearing, racial and gender slurs will not be tolerated. This includes verbal, written and obscene gestures. Students using inappropriate language will be automatically assigned a detention after school. Do not bring large sums of money or valuable articles to school. The school does not assume responsibility for money or articles that are lost or stolen. Guest teachers must be given the same respect as the regular teacher. Inappropriate behavior in the class when a substitute is present will not be tolerated. I will use only the Chromebooks or other devices when directed to do so by a teacher. I will inform the teachers immediately of any damage I notice that has occurred to the Chromebook or other school-owned device. I must be working on the assignment. If I am not working on the assignment, the Chromebook or other school-owned device will be collected and I will have to hand-write the assignment. The assignment will still be due on the original deadline. I will not eat or drink anything (including water) while I have a Chromebook or other school-owned device checked out. I will not have any food or drink (including water) on the desk while I work. I will carry the Chromebook or other school-owned device with both hands with the lid closed. I will not, in any way, damage the Chromebook or other school-owned device. This includes removing or rearranging keys, writing on or damaging the screens in any way, and changing the environmental (desktop, music, sounds, etc.) system, operating system, or software settings. If I do damage to the Chromebook or other school-owned device in any way, my technology privileges will be revoked for the semester (at a minimum). I will be required to hand-write assignments while my classmates use the Chromebooks or other school-owned devices. If you find something that belongs to someone else, you should turn it into the main office.� Theft is a serious offense.� Respect the property of others. Students who walk out of class without permission automatically receive a detention for each walkout. If they return to class, they also move up a step on the school discipline ladder. Carrying, bringing, using or possessing a knife or dangerous weapon results in a mandatory referral to law enforcement. You have a right to attend schools that are safe and free from unnecessary disruption. Proper student conduct, reinforced by an effective discipline program, is essential to create and maintain a positive school climate. This is the joint responsibility of students, staff, parents, and the community. The goal of student discipline is to teach students to behave in ways that contribute to academic achievement and school success, and to support a school environment where students and staff are responsible and respectful. School discipline is best accomplished by preventing misbehavior before it occurs, and using effective interventions after it occurs. School safety and academic success are formed and strengthened when all school staff and personnel build positive relationships with students and are actively engaged in their lives and learning. Effective school discipline maximizes the amount of time students spend learning and minimizes the amount of time students cause disruption or are removed from their classrooms due to misbehavior. School discipline should be reasonable, timely, fair, age-appropriate, and should match the severity of the student’s misbehavior. School discipline that is paired with meaningful instruction and guidance offers students an opportunity to learn from their mistakes and contribute to the school community, and is more likely to result in getting the student re-engaged in learning. Effective discipline is built on consistent and effective classroom management, and is supported by a positive school climate. The vast majority of disciplinary issues should be addressed at the classroom level by teachers; however, behaviors that cannot be addressed at this level should receive more targeted and intensive interventions, as determined by an individualized assessment. The District serves a diverse community. In order to serve all students and to prepare them to be members of an increasingly diverse community, school and staff must build cultural competence. We must strive to eliminate any institutional racism and any other discrimination that presents barriers to success. Student conduct which may be subject to disciplinary action includes those occurring during either curricular or extracurricular activities, in classrooms, in school buildings, on school grounds, or in school vehicles, when such conduct is detrimental to the school environment and to the welfare or safety of other students or school personnel. Building personal responsibility by helping individuals develop empathy, self-control, and motivation. Discipline procedures must guarantee due process to all students and must be enforced uniformly, fairly, consistently and in a manner that does not discriminate on the basis of ethnicity, race, color, religion, national origin, ancestry, gender, sexual orientation, age, or disability. All staff members share responsibility for maintaining a safe and orderly environment.� You must respond appropriately to directions given by any staff member whether or not the staff member is your teacher. 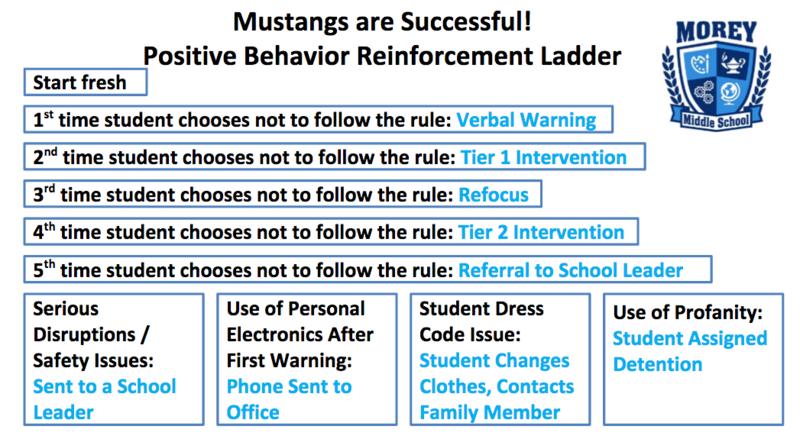 In class, students engaging in behavior deemed to be disruptive will be moved up the Positive Behavior Reinforcement Ladder. Students will have names written next to each step as they are moved up in order to ensure that teachers and students are on the same page about which steps students are on. 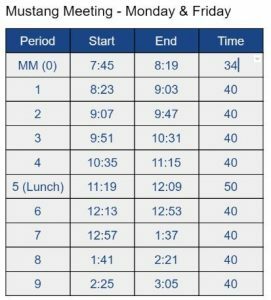 Any member of the MTSS team may request a meeting at any time. If a student is suspended out of school, Morey will do its best to arrange for the parent and student to come in on the day of the suspension for a special MTSS meeting. The purpose of this meeting is to focus on solutions and problem-solving in order to support a successful school environment once the student returns to school. 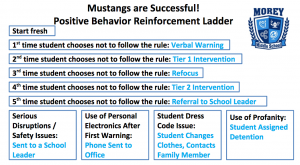 The MTSS team may determine by consensus appropriate consequences for student behavior, and if agreed upon by all adults, may be nontraditional in nature, but its primary function is to promote the positive behavior and well-being of the student.